This has been a bad day for Liberal Democrats Jeremy. 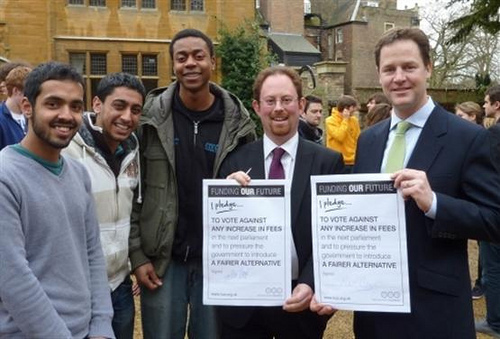 I’m appalled that university students have to pay, but it wasn’t the Lib Dems who ended those days. Shamefully it was Labour. I suspect that this will hang around Liberal necks for a long time because their presentation of the pledge and then the policy itself have been politically immature. If the party want to survive, they’re going to have to do a much better job of presentation and not get so entangled with one major issue. In the meantime. This policy is a failure because the coalition has failed to convince people that it’s fair. More importantly, they now need to work very hard to convince potential students that university education is worth the risk and likely to result in employment.